Large - $321.99 Only 2 left! Look as if you just descended from Heaven in our Heavenly Angel Costume. You will be a beautiful sight in white, looking truly angelic in this costume. We may be biased but we do think it's one of the most beautiful costumes out there. I mean, just look at it, you can't really disagree. What could be more beautiful than an heavenly angel? You'll become a visionary while you don our floor length gorgeous angel white dress with gold accents. Looking just as angels do in the movies, you will have a beautiful, classical look that includes both the large white organza, gold laced wings and a gold tinsel covered wire halo. These largely wonderful wings slide right into slots in the back of your dress to look as if you are the real deal. 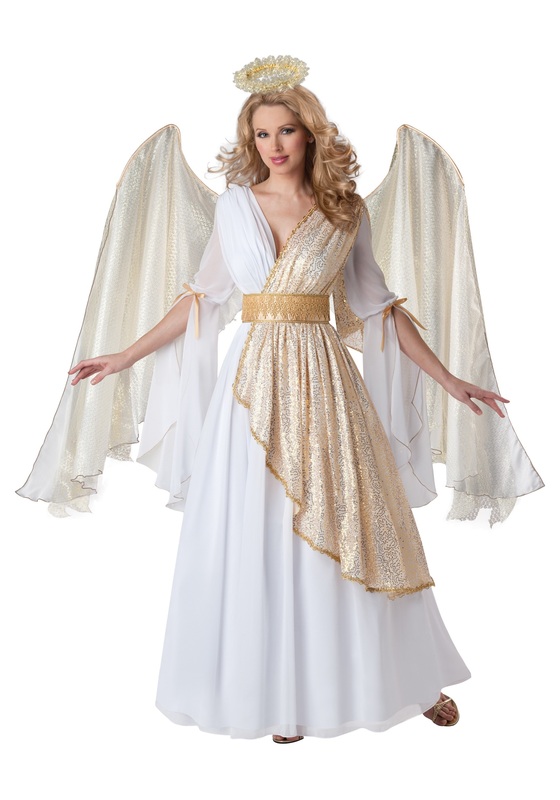 You will look truly heavenly when you wear this Heavenly Angel Costume! This costume can be worn for a variety of occasions, wear it for a Christmas program or even for Halloween. Whatever the case, you are sure to be the star of the show. You can even leave the wings and halo at home and the dress could become a renaissance or ancient goddess costume. The possibilities are endless! You will be turning heads everywhere no matter which route you decide to take with how ravishing you will look in this Heavenly Angel Costume.